We all adore summer and while Memorial Day officially kicks off the summer season, the three-day Memorial Day weekend is also a great time to shop because the holiday weekend has become a big sales weekend for things like home furnishings, consumer electronics and holiday packages. To us fashionistas however, it's all the fashion and designer sales on through the Memorial Day Weekend that are of particular interest. 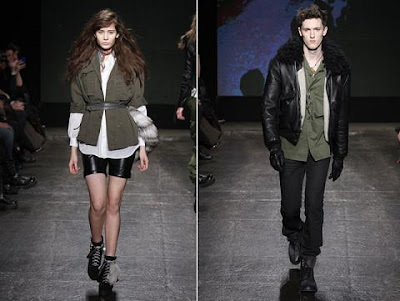 In fact, it's a great opportunity to freshen up our wardrobes with the season’s best new looks. Whether you’re after clothing or shoes, handbags or jewelry, there’s a sale out there waiting for you. Here are some of my fave Memorial Day Weekend Sales. In the spirit of the first official weekend of summer, Mishka are offering 50% off all online and in-store (New York and Los Angeles) on all Mishka Spring 2011 gear purchased on Memorial Day! 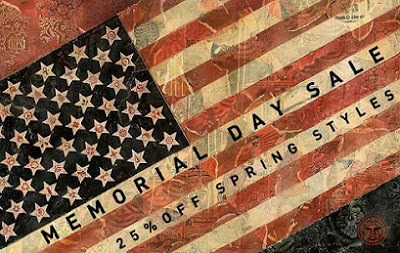 Through the Memorial Day Weekend OBEY Clothing is offering 25% off Spring styles. Friends and Fans of Catherine Malandrino use promo code holiday at checkout to bag 20% off on the entire online store plus get FREE Shipping during the Catherine Malandrino Memorial Day Sale through Monday May 30th. Spend $300 and save 30%. The Christian Audigier Memorial Day Weekend offer expires May 30, 2011 at 11:59pm PST. No promotional code is required and your savings will be automatically adjusted during checkout. Get 30% Off your entire purchase, including ALL dresses during the Neiman Marcus LastCall Memorial Day Sale. Shop both online and in store. The Neiman Marcus LastCall Memorial Day Sale is valid now through May 31, 2011, at Last Call® Stores and LastCall.com. Savings will be reflected at checkout. Shop the 'Mad About White' Memorial Day Sale at Mackage and get 30% off and in addition, all regular priced items in the Spring/Summer collection will be at 20% off with this exclusive promo code MemorialSummer2011 at checkout. Browse online or visit the Mackage NYC store from Friday, May 27th to Monday, May 30th to take advantage of this Memorial Day sale. Buy One Get One at 50% off at the Fashion to Figure Memorial Day Weekend Sale in stores only and 25% off online with code MEMORIAL25 from Friday May 27 to Monday May 30. Bag 50% Off storewide throughout the Memorial Day Weekend at DKNY Company stores. Also through Monday, save 30% OFF the DKNY Cozy and Swim collections online and in stores! The Latest Update: The DKNY Memorial Day Sale offer has been increased to 60% OFF!!! Enjoy 30% OFF the entire spring collection at the INHABIT Memorial Day Sale. Enjoy 25% OFF the entire collection this Memorial Day Weekend at SABON NYC, May 27th to May 31st. And for those lucky enough to be in New York, there's an in-store Memorial Day special. Get a FREE Fig Coco Sorbet with any $69 purchase. Perfect for summer! Get 30% Off dresses and shorts at the Memorial Day Sale at Lord & Taylor. Bag 30% Off everything throughout the Memorial Day Weekend long at Kensie Clothing with FREE shipping and FREE returns on orders over $100. You'll save up to 50% Off on select styles and colors at the Michael Stars Memorial Day Weekend Sale, May 27th to May 30th both in store and online. Take an extra 25% OFF your purchase of $100 or more on new and already reduced items with coupon code MEMORIAL at the 80's Purple Memorial Day Sale ending May 31st. Discount will be automatically applied. This Memorial Day Weekend take an extra 20% OFF sitewide with promo code STEAL20 at ShoeSteal.com. During the Memorial Day Weekend Sale at Linea Pelle Collection you'll enjoy 20% off sitewide through Monday, May 30th with code LPMEMORIAL20 at checkout.. Celebrate Memorial Day and shop star summer pieces at an extra 40% off at the Weekend Shop-In at The Outnet. Snap up printed camis, cute sundresses and denim minis by Adam, Anna Sui and more. The Weekend Shop-In starts 27 May 2011 at 12.00pm EDT and ends 31 May 2011 at 12.00pm EDT. There will be a 40% discount added to selected items at checkout. By invitation only, join William Rast for a Memorial Day Sale, Friday Mat 27th to Monday May 30th. Spend $250 and receive 30% OFF your entire purchase with promo code MEMDAY2011 at checkout. During the Memorial Day Weekend Sale at The Violet Hour you'll enjoy 30% off full-priced apparel through Monday, May 30th. Just enter MEMORIALDAY30 at checkout. At the Megan Los Angeles Memorial Day Sale take 15% Off New Items and an additional 50% Off Sale Items. Sale Ends Monday May 30th at 11:59pm. Save 20% at the Black Label Boutique Memorial Day Sale. This includes sale items as well, however, some designer exclusions apply and will be marked as such on the add to cart page. Use code MEM20 at checkout. This Memorial Day Sale ends on Monday May 30th at 12pm CST. It's 24% off sitewide at CoutureCandy with code M24 through Monday May 30th at 11:59pm. Go! Go! Go! Get 20% off all shoes and bags through Monday, May 30th at the Oak Memorial Day Sale both online and in store at Oak Bond and Oak Williamsburg. Discount will be automatically applied. Take an extra 40% off your order in the Memorial Day Weekend Sale at C & C California with code EMEMDAY40 at checkout through Monday, May 30th at 11:59pm PDT. Get 30% off all apparel and handbags at the Betsey Johnson Memorial Day Weekend Sale. The 30% offer applies to sale and full price dresses, apparel, intimates and handbags both online and in retail stores (excluding outlet stores) through Monday, May 30th at 11:59pm ET. Shop everything at 30% OFF this Memorial Day Weekend at Lindsay Lou with code memday. This sale ends on Monday, May 30th at 11:59pm PDT. And don't forget Kmart.com's Online Only Memorial Day Sale with thousands of Items on sale up to 35% off or more, plus save an EXTRA 5-10% off almost everything including sale items. Plus, get FREE Shipping on all mailable Kmart.com orders of $59 or more with coupon MEMORIALDAY. Find incredible savings on Patio Furniture, Grills, TVs, Lawn & Garden, Apparel, Home, Swing Sets, Trampolines, Pools, Camping & Hiking, Bikes and so much more! And don't forget to shop early for the best savings on Graduation Presents! Save on TVs, MP3 Players, DVD Players, Computers, Laptops, Printers and more! A Final Message for the Memorial Day Weekend! Whatever you're doing, we wish you all an awesome Memorial Day Weekend and hope that the above list of our Memorial Day Weekend Sale faves helps better prepare you for some serious shopping for the upcoming summer season. Finally, we salute those that gave their lives for this country. God Bless America! What an awesome range of memorial day sales, discounts and offers. Sounds a fab day to book your retail therapy session!